Read the original article online at ND Newsire. When IBM created its cognitive computer system, Watson, it was projecting far into the future but not as far as one might think. Watson’s deductive abilities and incredible data retrieval speed allow it to sift through vast amounts of data and process information in ways similar to those of the human brain, including an understanding of basic language as well as some human nuances. But the machine’s purpose was more than mimicry; it was created to access and analyze data, helping organizations identify trends and operational hiccups while projecting possible outcomes. In January 2011, the world witnessed Watson in action as viewers watched the TV game show “Jeopardy!” During a tournament-style competition, Watson beat some of the greatest “Jeopardy!” contestants to grace the screen, but what was more important is that Watson showed the enormous potential offered by computers in the areas of natural language recognition, data analysis and the processing of solutions. These are the same analytical skills companies that want to become bigger, stronger, faster and leaner will be demanding of their employees in the next eight to 10 years. And they are the same skills IBM is seeking to inspire in the next generation of engineers and scientists through its support of the IBM Watson Solutions Faculty Awards. The IBM Watson Solutions Faculty Awards recognize individuals who are on the cusp of the next big trend in computing — big data and analytics — and are introducing that information to their students via innovative curricula. Among the 10 instructors recently named recipients of the 2012 IBM Watson Solutions Faculty Award is Nitesh Chawla, the Frank M. Freimann Collegiate Associate Professor of Computer Science and Engineering and director of both the Interdisciplinary Center of Network Science and Applications and the Data, Interference, Analytic and Learning Lab at the University of Notre Dame. Like the other recipients, Chawla is being honored this month for development of a unique program that combines business and technical skills that support use of big data and analytics in finding solutions for some of society’s biggest issues. Chawla’s winning proposal focuses on the intersection of big data and health care innovation and how best to present those issues to students, who will become the next generation of innovators. The availability of the digitized data that already exists in many health care systems across the country offers the opportunity to explore and take advantage of novel large-scale analytics that can be used in patient-centric health care. This data and smart analytics, when employed by cognitive systems such as Watson, could lead to improved outcomes and better management of chronic diseases; proactive and preventive treatment strategies; a reduction in health care costs through the empowerment of patients and physicians; and pre-emptive measures such as lifestyle adjustments and accountability in care. This “smarter” continuum — from technology to application — will prepare students to better meet today’s health care challenges. Students will not only learn data mining/machine learning concepts, but they will also develop insights about the medical evaluation process, the physician-patient adoption of technology and the societal implications. According to Chawla, this integrative education and its application to health care, especially when aligned with the use of cognitive systems such as Watson, are critical as the foundation for cost-effective, patient-centric care of the future. Chawla’s area of research is data mining and machine learning. He is also at the frontier of interdisciplinary applications with innovative work in health care analytics, climate and environmental science and network science. His research in data-driven personalized health care is focused on patient-centered disease diagnoses and management. 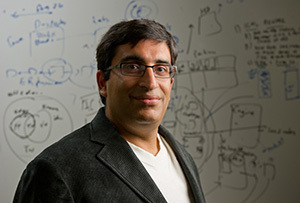 Chawla is the recipient of multiple awards for research and teaching innovation, including a National Academy of Engineering New Faculty Fellowship and a number of best paper awards and nominations. He currently serves as the chair of the IEEE CIS Data Mining Technical Committee and also serves on a number of editorial boards and organizing/program committees for conferences. He is a fellow of the Reilly Center for Science, Technology and Values and the founder of Aunalytics Inc., a startup focused on big data and analytics, housed at Innovation Park at Notre Dame.